- Writer whose prose style, derived from everyday speech, influenced American short story writing between World Wars I and II. Anderson made his name as a leading naturalistic writer with his masterwork, "Winesburg, Ohio" (1919), a picture of life in a typical small Midwestern town, as seen through the eyes of its inhabitants. Anderson's episodic bildungsroman has been compared often to Edgar Lee Masters's "Spoon River Anthology". 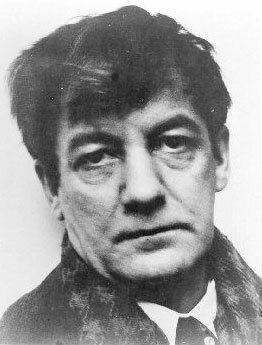 - Sherwood Anderson was born in Camden, Ohio. His parents led a transient life, moving from one place to another after work. His father had served in the Union Army and declined from the saddlery-and-harness business into odd jobs of house- and sign-painting. Anderson attended school only intermittently, while helping to support his family by working as a newsboy, housepainter, stock handler, and stable groom. At the age of 17 he moved to Chicago where he worked as a warehouse laborer and attended business classes at night. During the Spanish-American war Anderson fought in Cuba and returned after the war to Ohio, for a final year of schooling at Wittenberg College, Springfield. - For the next few years Anderson moved restlessly around Ohio. His life calmed down for some time with marriage and with work as a paint manufacturer. After suffering an emotional crisis - more or less orchestrated by Anderson himself - because of the conflicting demands of his family, business and creative life, he left his wife, 'bourgeois lifestyle', and moved to Chicago. There he took again a job in advertising and joined the so-called Chicago Group, which included such writers as Theodore Dreiser and Carl Sandburg. - Anderson's two first novels were "Windy McPherson's Son" (1916) and "Marching Men" (1917), both containing the psychological themes of inner lives of Midwestern villages, the pursuit of success and disillusionment. His third novel, "Winesburg, Ohio", was "half individual tales, half long novel form", as the author himself described it. It consisted of twenty-three thematically related sketches and stories. Written in a simple, realistic language illuminated by a muted lyricism, Anderson dramatized crucial episodes in the lives of his characters. The narrative is united by the appearance of George Willard, a young reporter, who is in revolt against the narrowness of the small-town life and who acts as a counterpoint to the other people of the town. The individual tales of "Winesburg, Ohio", and Anderson's other collections of short stories, "The Triumphs of the Egg" (1921), "Horses and Men" (1932), and "Death in the Woods" (1933), directed the American short story away from the neatly plotted tales of O. Henry and his imitators. The stories in these books are characterized by a casual development, complexity of motivation, and an interest in psychological process. - In 1921 Anderson received the first Dial Award for his contribution to American literature. He traveled widely in Europe - in Paris he met Gertrude Stein, whose work he much admired. "She is an American woman of the old sort, one who cares for the handmade goodies and who scorns the factory-made foods, and in her own great kitchen she is making something with her materials, something sweet to the tongue and fragrant to the nostrils." After he returned back to the United States, he settled in New Orleans, where he shared an apartment with William Faulkner. He wrote, among others, the novel "Dark Laughter" (1925), which became a bestseller. In the story the disillusioned protagonist travels down the Mississippi imagining the kind of book Mark Twain might now write. - From New Orleans Anderson moved to New York for some time, and from there finally to Marion, Virginia, where he built a country house, and worked as a farmer and journalist. To earn extra income he continued his series of lectures throughout the country. Commissioned by "Today Magazine", Anderson studied the labor conditions during the Depression and collected his articles in "Puzzled America" (1935). Anderson's newspaper pieces were collected in "Hello Towns" (1929), "Return to Winesburg" (1967) and "The Buck Fever Papers" (1971). - Anderson's best works influenced almost every important American writer of the next generation. He also encouraged William Faulkner and Ernest Hemingway in their writing aspirations. Anderson died of peritonitis on an unofficial good-will tour to South America, at Christobal, Canal Zone, on March 8, in 1941. After his death, Anderson's reputation soon declined, but in the 1970s, scholars and critics have found a new interest in his work.